Welcome to another installment of LiveAnalysis! Today’s match-up will mark the 21st time that David Ferrer has to face his countryman (and tormentor) Rafael Nadal. David Ferrer has lost only one set in the entire tournament (to none other than Fabio Fognini, who was playing some of the best tennis I’ve ever seen him play), while Nadal has had an unblemished run to the final, even though he faced Nicolás Almagro in the semis. Ranked #12, Almagro represented the toughest challenge for Nadal since his comeback started. That is, until tonight. – Nadal has won 14 of the 15 matches played on clay against his friend, with Ferrer’s lone triumph coming in 2004 at Stuttgart. That’s almost 9 years ago. – More worrying for Ferrer might be the fact that he hasn’t been able to take a set off Nadal on clay since the 2008 Barcelona final (which was an excellent match, by the way). 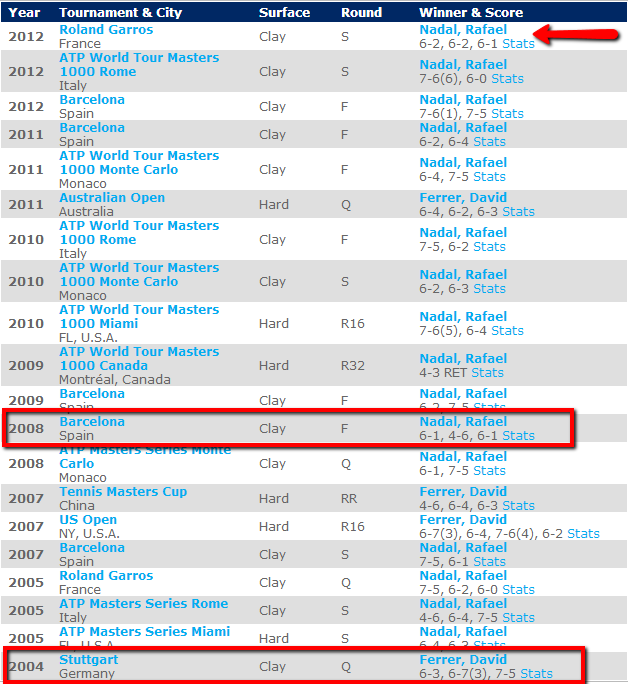 That’s astounding, given that they’ve played 8 times on clay since then. – Putting it in a different way, Ferrer has lost 18 straight sets on clay against Nadal. That…is incredible, when you consider that Ferrer is one of the world’s four best claycourters. – Of those 18 sets, 4 have been 7-5 affairs, and 3 have been tiebreakers. So there’s that. – This is the first time that Ferrer and Nadal will play on clay outside Europe, and the first time since Stuttgart that Ferrer doesn’t have to play Nadal in one of his strongholds. 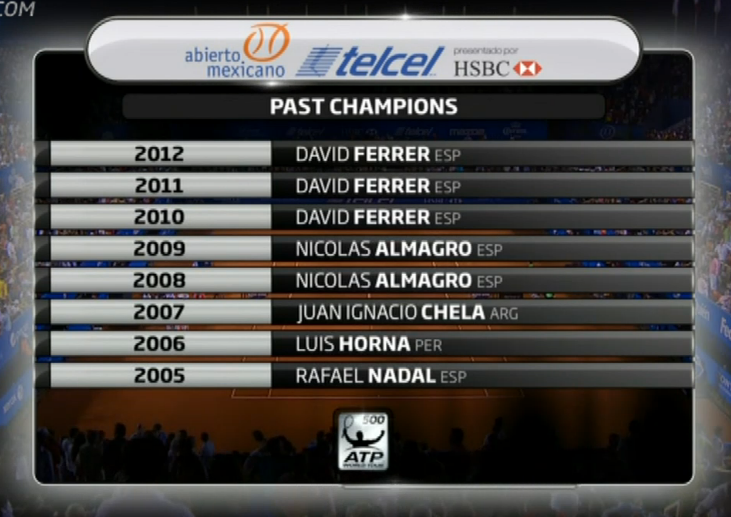 Acapulco has actually been Ferrer’s fortress during the past three years. Can Ferrú make that count tonight? 1. Can David Ferrer manage to win the first set? This is the key for me – Ferrer has traditionally played Nadal tough for one endless, grueling set, which he eventually loses, along with his belief that he can actually win the match. Delivering that initial blow will be absolutely vital for the man from Javea if he’s to have a chance to claim what will amount to a most significant win. 2. Who will be able to better protect their serve? Nadal’s return game was quite sharp against Almagro yesterday, and Ferrer is one of the tour’s elite returners. Ferrer knows that he can break Nadal’s serve – he’s done it plenty of times during their clay matches. 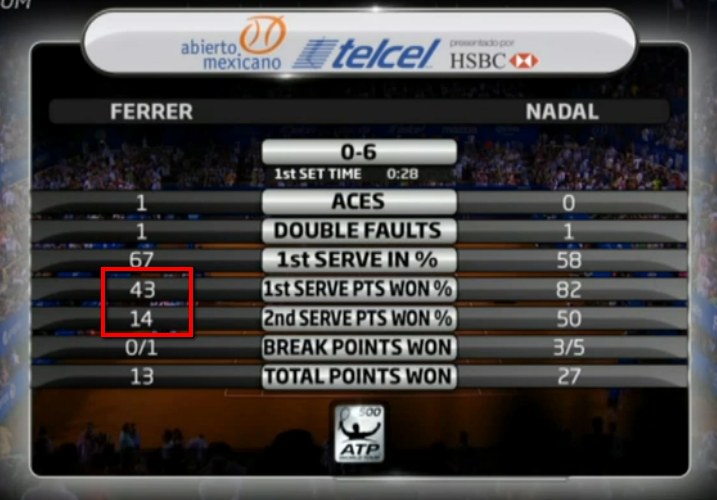 The issue for Ferrer has been protecting his own serve against Nadal’s attacks. Whoever can find any kind of pattern that helps then get free points on serve will likely have an edge tonight. 3. My wife, an avid Nadal fan, mentioned that Nadal’s movement to his forehand side wasn’t all that great during the Almagro match. Even if Ferrer doesn’t pick up on this, this weakness on Nadal’s movement plays directly into Ferrer’s favorite dynamic against his good friend: camping out on the backhand side and blasting inside-out forehands into Nadal’s forehand corner. Nadal will have to go down the line frequently with his own forehand to counter this pattern – provided he gets to the ball in time. That man is so unimpressed at the sight of Nadal practicing that he decided to take a nap instead. Instant classic. The men are on court! Remember to refresh this page often, as I will be providing game-by-game updates throughout the match! 0-0: First point: backhand down the line winner by Nadal. Noteworthy. A indecisive FH approach by Ferrer leads to a great Nadal CC FH pass that Ferrer’ can’t handle. First BP of the match, which is saved when Nadal goes for a BH DTL and misses wide. Untroubled, Nadal hits a fantastic CC angled FH, and it’s BP #2. Ferrer sends a regulation FH into the net, and Nadal breaks to start! That was…problematic for Ferrer, who was not as sharp as he needed to be to survive that game. It’s clear that Ferrer will implement the Novak Djokovic plan tonight: direct any and all traffic to Nadal’s BH, and look for any resulting short balls to attack. Execution was not sharp enough in that first game. 1-0, Nadal: At 15-30, Ferrer leaves a 2nd serve return way, way short. Nadal pummels it with his FH, and it’s 30-all. A service winner and a Ferrer FH UFE later, and Nadal consolidates his break. Ferrer is way, way too nervous. Maybe losing the first set easily will change the dynamic of this match-up? As we saw last year at the French Open…probably not. 2-0, Nadal: Ferrer digs himself a 0-30 hole, digs himself out, but hits a bad dropper that Nadal easily puts away. It’s 30-40, BP #3 for Nadal. 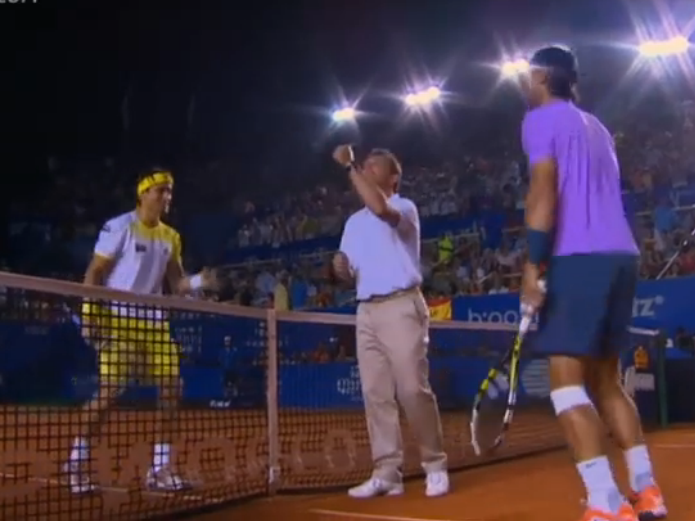 They play a tentative rally, and Nadal sends a tame FH into the net, unprovoked. Deuce #1. Then a Ferrer BH UFE makes it BP #4 for Nadal. Ferrer now with a wild FH UFE, and Nadal is up a double break! There are very few things that are going well for David Ferrer tonight. He’s tight as a drum, and Nadal is playing a very focused final. The main issue for Ferrer is that Nadal’s BH is not coughing up that many short balls, so Ferrer is forcing the issue on shots where he’s not that comfortable attacking to begin with. Unless Ferrer calms down, regains his focus and grasps some sort of confidence, this will be a very short final. 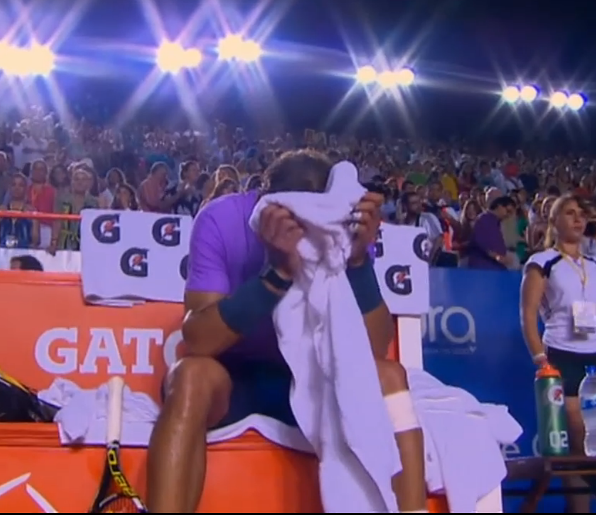 3-0, Nadal: At 30-15, Nadal hits the saddest BH dropper ever. Then Ferrer finally hits a competent FH DTL to force Nadal’s error, and he has his first BP of the match. Which goes begging after a pretty soft BH DTL miss. Not even a point-ending shot. A Ferrer UFE and a bad return later, and Nadal has held. The problem with Ferrer trying to implement the Djokovic Plan against Nadal is that Ferrer doesn’t hit the BH DTL particularly well (and isn’t all that comfortable doing so, either). Ferrer needs to start making this an Ad-court battle, and fire away with his inside-out FH. 4-0, Nadal: Nadal gets the opportunity to fire away with his FH from the middle of the baseline, and as you’d expect, ends up winning the point. 15-40. Nadal hits a gorgeous CC BH angled return, and two strokes later, he breaks for the third time! This is starting to be a little embarrassing for Ferrer. His initial gameplan hasn’t worked at all (though you might say that the execution has been so poor that any gameplan would’ve failed), and is on his way to getting bageled by Nadal. Nadal, though, is playing very, very solid ball. To say the least. 0-0: Ferrer finds himself down 15-40 after hitting a very predictable FH approach shot to Nadal’s FH that saw him get easily passed. Ferrer then misses a BH DTL for the 194948578509th time to hand Nadal the break! I’ve praised David Ferrer quite a bit about his tactical abilities, but tonight he’s putting up a demonstration of what NOT to do on a tennis court when your gameplan is not working. Ferrer has to stop trying to hit BHs DTL as a normal rally shot – he’s leaving himself vulnerable, and missing way too many of them. He’s better served running around that BH and hitting inside-in FHs, or what I’d love him to do, pummel inside-out FHs. 1-0, Nadal: Nadal consolidates at 15 after an array of Ferrer errors and short balls simplify his work. 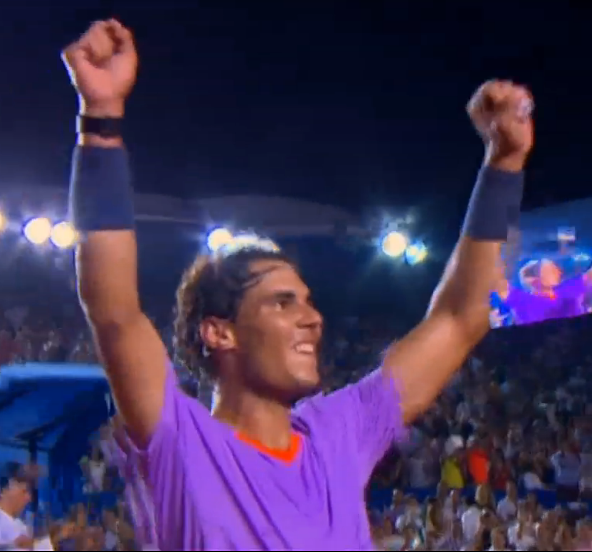 8 straight games for Nadal, just as Errani won the first 8 games of the women’s final earlier tonight in Acapulco. 2-0, Nadal: A Ferrer FH UFE makes it 30-40. BUT FERRER SAVES A BP!!! With an INSIDE-IN FH!!! Much better than sending yet another BH DTL wide. Two tame Nadal errors later, and DAVID FERRER HAS WON A GAME. That was much better from Ferrer. He finally switched from hitting bad BHs DTL to a good inside-in FH on that BP (that was almost a match point, really), and then pummeled FHs to great effect. No other way around it. 2-1, Nadal: Nadal makes a very strange FH UFE out of nowhere, and Ferrer has a chance to get back on serve, something that hasn’t happened since…the start of the match. The chance goes begging as Ferrer sends a BH return long. Two points later, we’re back at Deuce after a second return winner from Ferrer. However, Ferrer sends a BH DTL long for the 19495985795098th time, and then loses his footing after a good Nadal loopy FH. Ferrer has decided that this gameplan will be used all match. Which means that this match won’t last very long. Oh, well. 3-1, Nadal: At 30-15, the two friends play an incredible point, that ends with a most beautiful Nadal lob winner. In incredible shot, to end a wonderful point. Then Nadal hits a BH DTL winner (!!! ), to set up 30-40. A strange rally ensues, where Nadal badly frames a FH, but gets lucky as the shot lands in, and soon after Ferrer sends yet another inside-out FH into the net. Nadal has the double break! 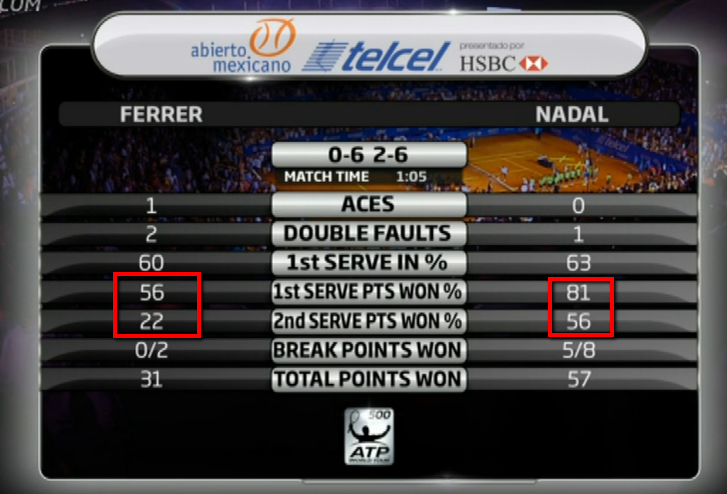 Nadal went up a notch just slightly in that game, and that was more than enough for a double-break. Ferrer has not been able to raise his game at all tonight. Hence why we’re in this currently lopsided situation. 4-1, Nadal: Nadal holds easily to 15. This will be ending very, very soon. 5-1, Nadal: Ferrer had built his first 40-0 lead of the match, and saw one of his serves get obliterated by a ridiculous FH DTL return winner. Regardless, Ferrer holds moments later, and Nadal will serve for the title. 5-2, Nadal: Ferrer goes for a big return, misses badly. 15-0. Body serve return goes into the net. 30-0. CC BH UFE by Ferrer, 40-0 and triple championship point. You could hear some jeers there. 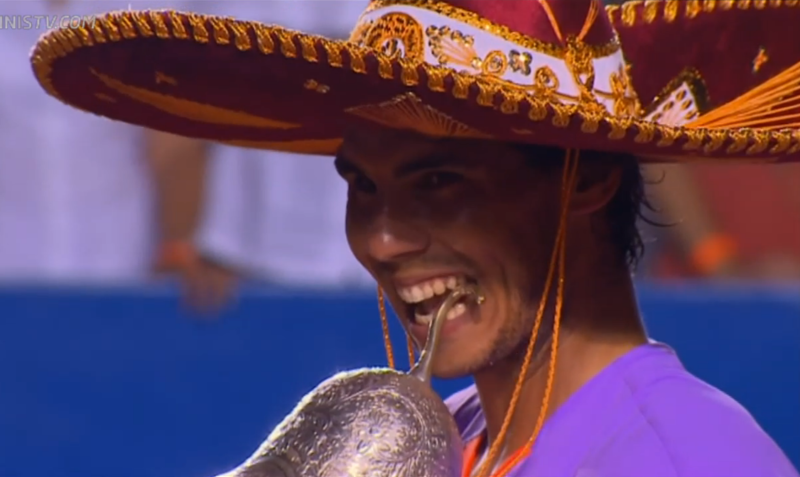 Nadal then clinches the Acapulco title with a blistering BH DTL winner, just when Ferrer thought he had wrong-footed him. And here’s your winner having an emotional moment back on his chair. It’s been quite a journey, no? 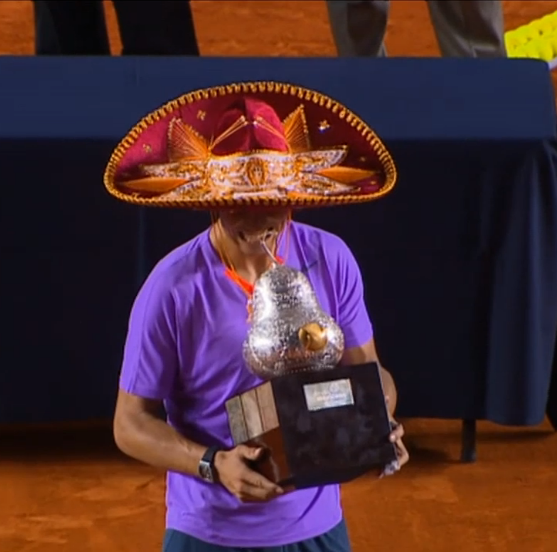 Reminds me of Nadal’s reaction after winning last year’s French Open. Game, set and match to Rafael Nadal, 6-0, 6-2. There were all sorts of questions about Nadal heading into the Almagro match. All of them were answered. There were more questions about Nadal heading into this match, the first time the King of Clay would play a top 5 opponent, on said opponent’s favorite surface. And they were all answered in the most emphatic of ways. Rafael Nadal Parera was extremely impressive today – there wasn’t a facet of his game that didn’t stand out, really. He served well, returned well, blasted his FH well, hit his BH EXTREMELY well, and didn’t let Ferrer off the hook for one second. It was a ruthless performance by someone who wasn’t sure himself if he could reach these heights so soon after a 7 month absence. In other words, Rafael Nadal is back, ladies and gentlemen. 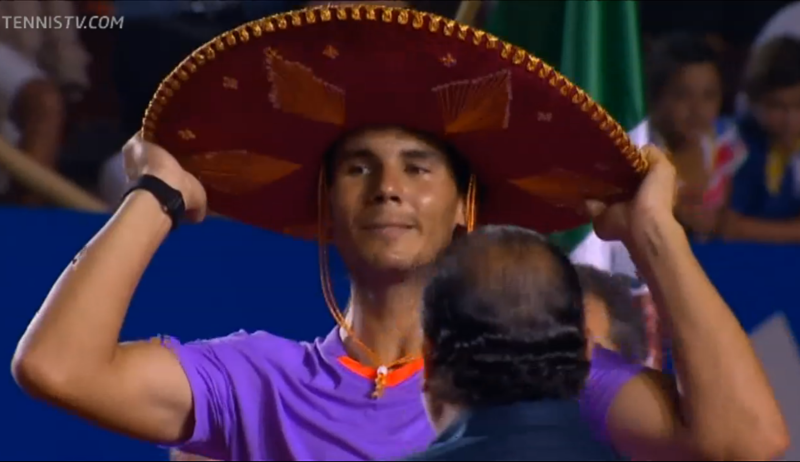 And to commemorate the occasion, why not a Nadal-in-a-sombrero photo essay? Much thanks for this live analysis, especially since my ESPN3 stream keeps crapping out on me and I can’t see enough myself to know if Ferrer is playing equally crappily or Nadal is just THAT good. You’re very welcome, Ophelia! Sorry to hear about ESPN3 – my wife kept complaining about the same thing. The TennisTV had a few blurry moments but was overall satisfactory. Nadal is just THAT good. Would have been nice if you had given Rafa a little bit of credit Juan. He played amazingly well and gave Ferru nothing. Way to go Rafa!!!! Toot, my wife had the same sentiment, and you both are right. Hence, I added a paragraph before the sombrero screencaps. If you refresh the page you’ll see it! It’s an ongoing peeve of mine that Rafa doesn’t get the credit he deserves. When Roger wins the media and the blogosphere rhapsodize about what a genius he is. When Djoker wins, it’s all about how amazing he’s playing. When Murray wins, there’s not as much praise but more of good for him, he deserves it after all this time. When Rafa wins – bupkis. It’s about how badly his opponent played and all the mistakes they made. It’s not a coincidence that Rafa has the best career winning percentage of the open era, or that he has winning H2H’s against everyone but Davydenko (and Rosol). He is an amazing tennis player and his record proves it. It was kind of funny how it took a seven month absence for a lot of people to recognize how much tennis missed Rafa, and you just have to look at the crammed stands for every match he’s played since his comeback to realize how beloved he is by the fans too. Now on to IW. Another big test for him but you can see his physical conditioning and his knee improve in every match and more important, his confidence and his happiness to be back playing well. Thanks, JJ. Missed the match as it started at some ridiculously early hour my time so very much appreciate having a Live Analysis to read. In previous matches I thought it was Ferrer’s FH that bothered Nadal most – not sure why he’d depart from that…except that despite all that botheration, it rarely added up to anything in terms of results. Someone on Twitter (forgot who) suggested that the 7 month absence had changed the Rafa-Ferrer dynamic – if anything did, I think it was Rome last year.